The aim of this study was to evaluate the effects of long-term mineral and organic fertilisation on crop performance and soil fertility. The Long-Term Nutrient Depletion Trial (Denmark) was used to analyse changes in concentrations of Olsen-P, exchangeable potassium (K) and soil carbon (C). Yield responses (2010–2016) were evaluated making use of an early-season temperature model, fertilisation practices were evaluated by nutrient budgets, and nitrogen use efficiency by calculation of apparent recovery (ANR) in subplots receiving mineral N.
Olsen-P (r2 = 0.68, P < 0.001) and exchangeable K (r2 = 0.86, P < 0.001) were correlated with the nutrient budgets. 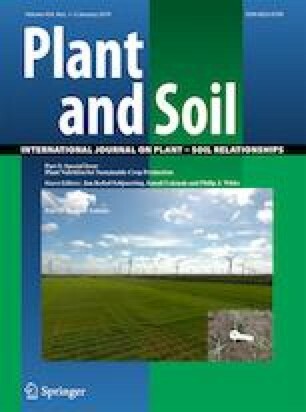 Soil C concentrations increased from 10.0 g kg−1 (1995) to between 11.1–14.6 g kg−1 (2016), with the greatest accumulation under slurry applications (P < 0.05, equalling 17–47% retention of slurry-C inputs). Relative yield responses of spring barley were associated with early season cold stress, but the model was not applicable to other crops. Increases of ANR in response to long-term phosphorus (P) applications were not significant. Balanced fertilisation is an effective way to maintain nutrient availability, and to ensure high and stable crop productivity and efficient use of nutrients. Direct C inputs from animal slurry are a major driver for increases of soil C concentrations. The online version of this article ( https://doi.org/10.1007/s11104-018-3754-y) contains supplementary material, which is available to authorized users. This research was conducted over many years and would not have been possible without the technical staff at the experimental farm in Taastrup, in particular Carsten Jørgensen, Knud-Erik S. Knudsen and Keld Skov Nielsen, who have been of crucial value to the field experiment over the years. Thanks also to Simon Fiil Svane for his extensive work on the local weather station and data.